What a gorgeous kitty you are Bobby, and smart, too. You knew who to chose for your human that day at the shelter! We are so glad you found someone who appreciates you for the playful boy you are, and your pictures are adorable! 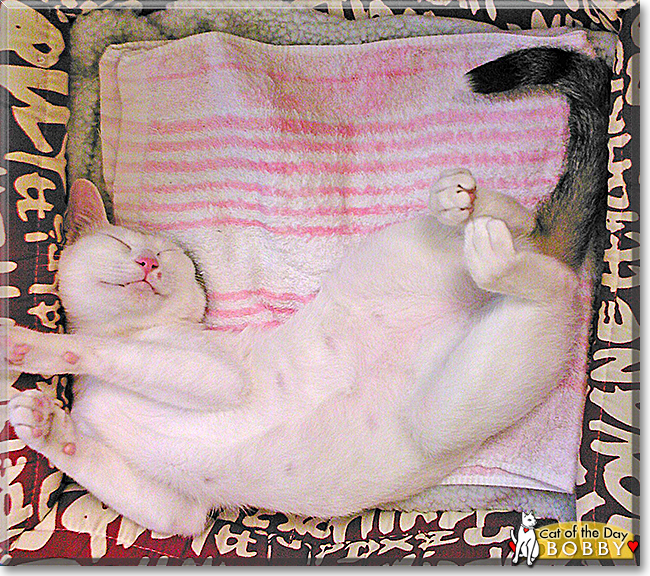 Congratulations again, sweetie - you are Cat of the Day for the whole world to celebrate! Dearest Bobby, you are gorgeous! What a stunning, beautiful guy you are! You are so pretty in both of those great photos, and thank you for sharing them with us. What a talented photographer your dear person is, and what a perfect model you are for him/her! In that second picture of you on your back, are you looking for a tummy rub? I wish I could reach through the screen and all the way around the world to Hong Kong to rub your tummy (only if you want it rubbed, of course) and pet you! I can't, of course, but I know your loving and beloved person will rub your tummy if you so desire and pet you for me . And what a delightful story you have to tell! You and your dear person adopted each other from the SPCA of Hong Kong. We're so very grateful to her/him for choosing rescue. What an excellent example you are of the fine treasures of pets to be found in rescue shelters! You have the most delightful personality! You are very active and play chase with your person in the house. You are quite talkative when you have something to say, such as when you're happy, excited, or want something like having your litter box cleaned. You are also very affectionate. You like everyone, and anyone who pets you is your friend forever. You and your dear person love each other very much, don't you. What a wonderful love-filled home you share! Congratulations, darling Bobby, on being chosen today's Cat of the Day! We hope you and your dear person and all your family and friends are enjoying a fine celebration, full of fun and lovies and all your favorite games and treats. Greetings, Bobby in Hong Kong! Happy Cet of the Day to you! To say you are one breathtakingly beautiful boy would be an understatement, Bobby! And oh my, you sure know how to strike a pose, hehe Your expression, that look of wide eyed wonder in that top shot is priceless! And how that soft belly is begging to be rubbed! How blessed your human was, the day she chose rescue, that fateful day at the shelter when you chose her to be your furever human, your one and only! Not that you don't spread the love around! As your mom says, you've never met a stranger! But no doubt there's but one who holds the key to your heart...your mom! What a lucky lady she is, having a furkid, a best friend and loving companion in you Bobby! You're the best! Thanks for the BIG smiles, sweetheart! Meeting you this evening has been a real treat! Hope you're enjoying a very special Cat of the Day celebration, playing chase, cuddling with your mom, being loved and pampered to pieces! Lots of love, cuddles and kisses to you, beautiful Bobby, our very special and most deserving Cat of the Day, EVERY day! Dear Bobby, what a most handsome boy you are. Your sleek coat looks so soft, and your face with those big green eyes is beautiful. I'm glad that you were adopted from the SPCA, where you actually picked your forever person. You thrive on attention, and you get plenty of it. You will make sure that you are being heard. I can't imagine that anybody would ignore you. You are a sociable and affectionate kitty, you have never met a stranger. It takes just a little petting from somebody, and they will be your new best friend. And your favorite game to play with your person is chasing each other through the house. Bobby, you are indeed a special and precious boy, and I wish you and your family a great day full of celebration, and many more happy and healthy years together. Hello, Bobby in Hong Kong! Happy Cat of the Day! You and your person chose one another at the SPCA that day! You can make a new friend by receiving petting and you have many things to say! You are happy and affectionate, and you're good with attention. You even have a favorite game! I am sending you some extra petting and snuggles for your big day! Happy Cat of the Day to Bobby! Bobby is a magnificent COTD! I love that he is such a darling and loving little cat. He reminds me of Bobby Deniro, maybe that little beauty mark and his charismatic demeanour. Anyhow, huge fan here! Bobby is an outstanding and perfect COTD! How handsome you are Bobby Boy, congratulations on being COTD!